Ask Your Customers. If you send out an email newsletter, ask them to contact you and share ideas of what they’d like to see on the site. Ask them on Facebook and Twitter. Ask them in person if you can. Ask them in a blog post. 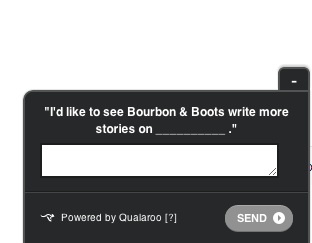 Ask them on your site like in the example below, which is a great little popup on BourbonandBoots.com. Do Some Research. Dig into your analytics and see what keeps your visitors’ attention the longest. If most people who hit your blog post about “Top 10 Vegetarian Lunches For Kids” spend 5 minutes there while most people who hit your “Top 10 Fast Food Lunches For Kids” immediately bounce, maybe your users would like to see more vegetarian posts. There could be many different reasons why this would happen, of course, and naturally it doesn’t indicate — at least not by itself — that you need to only write posts about vegetarian food. Maybe you’ve built some links with misleading anchor text that’s driving visitors to the fast food post, for example. Maybe people finding that post through organic search do read it without immediately leaving. That’s why I say you need to dig in, as a quick glance isn’t going to give you definitives if you don’t consider the “why” part of the equation. Think About Offline Methods. I have a subscription to a monthly magazine that does a yearly survey to see what their readers like and don’t like. This year, they’ve decided to add an entirely new magazine section based on user feedback. If you have the ability to get offline feedback like this, do so. Go See Which Of These Ideas Your Competition Has Implemented. One-up them with a better version. If they created a video series that shows you how to fix a dishwasher and that’s all they did, go create a step by step tutorial with text and images for the ones of us who hate watching videos, even if they are informative. If they haven’t done a video, do one. If they have written an article that is nothing but opinion, write a fact-based piece. If everything written about a topic is dry, write something funny. Look At What’s Being Shared On Social Media. What terms and lingo are people using? Maybe you say “do it yourself” but everyone else uses “DIY.” Do a Twitter search for some relevant topics and look at what’s getting lots of shares. See what your competitors are tweeting. See what they’re doing on Facebook, Pinterest, LinkedIn, Foursquare, etc. Use Alerts! I certainly do harp on these enough, I know, but I really do think that for a busy person, there is no better way to keep your eyes on everything than using (FREE) alerts. Google has their own Google Alerts but I much prefer Talkwalker’s Alerts, and they just released a free app that works with Hootsuite, so that’s a very promising way to save time. If your site is in the local wedding photography niche, set up related alerts so you can see what other local wedding photographers are doing. If you’re using a local slant on something, keep that in there, certainly, but add some information about how it’s relevant for a broader region. Example: you run a local mobile dog grooming business where your usual thing is to park at ten major spots in your small town and have customers bring their dogs to you. You create a local app that tells customers where the current closest parked location is to them, and if they check in there on Foursquare, they get 10% off. You write a post about this app and tell the story of why you decided to work at these locations which happens to include the fact that many of them are near popular local parks. Since you take a vacation to a new state every year, you decide to profile other similar businesses located in those states. In this piece about the local app, you link to each of those business profile pages that you’ve created on your site. Don’t Forget About Your Existing Customers/Audience! One thing that really bugs me is that when you’re someone’s customer, the only time you’re offered a discount or coupon is if you complain or threaten to leave. Some businesses are brilliant at keeping their existing customers happy, of course, but many others forget that you have to work to keep people loyal. If you’re able to give new customers a one-time 15% off coupon when they sign up, go ahead and email a free shipping code to your customers who haven’t ordered in a few months. Find ones who’ve been with you for more than a year and offer them a discount on their next purchase. Don’t just focus on getting new business; focus on keeping the business that you have. Obviously, some sites are dedicated to specific demographics; but, what applies to them usually also applies to others. If you run a site dedicated to Latina culture and beauty then, of course, you’ll be attracting readers from other cultures, so it would be ridiculous not to take advantage of that fact without losing your focus. I have a serious addiction to Latin American food and subscribe to a magazine geared toward Latinas mainly for the recipes, but I also like reading something besides the usual. I’m not their target audience, but I’m definitely consuming what they produce. Even the most amazing content won’t generate links if it’s not shared, so don’t forget the importance of getting your pieces out there. If you’ve asked your email subscribers for feedback and you implement their ideas, let them know, rather than just hoping they’ll follow up themselves. Use social media to get your content in front of people rather than hoping they’ll happen upon it. Last of all, I’d advise taking a look at these 75 content starters for any industry, which is a fantastic reference to get you started in case you’re having trouble figuring out what to write about. It does get easier, but there can be a lot of writer’s block and panic at first. If you can’t get started writing something, write the middle or the end, and work your way backward. We’ve had some link builders who say they can’t possibly write content because they’re not good at it. However, once they actually do it, almost all of them are naturals.